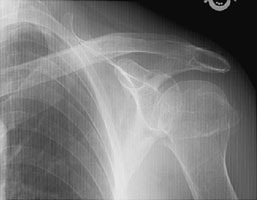 Fractures to the proximal humerus typically occur in elderly osteoporotic patients who fall on an outstretched hand. Fractures may involve the head, neck, or proximal shaft. The four segment Neer classification is used for treatment and prognosis. The four segments are the anatomic neck, the surgical neck, and the two tuberosities (greater and lesser). Neer one-part fractures are those with no to minimal angulation (less than 45 degrees) and no to minimal displacement (less than 1 cm) of the fracture fragments. Any of the four portions of the proximal humerus may be fractured. Neer two-part fractures consist of three nondisplaced and one displaced fracture fragment. Neer three-part fractures are those with two displaced and two nondisplaced fracture fragments. The lesser or greater tuberosity must be involved. Neer four-part fractures are those in which three fracture fragments are displaced. Avascular necrosis is common with these types of fractures. 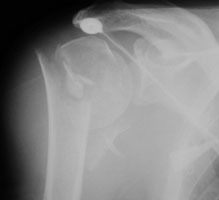 A AP radiograph of the left shoulder. This shows a minimally displaced fracture of the left humeral neck (Neer one-part). B Axillary view of the left shoulder. The single fracture with minimal displacement is better seen (Neer one-part). C AP radiograph of the right shoulder. 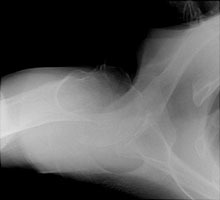 This depicts fractures of both tuberosities and a surgical neck fracture (Neer four-part).